The participants came and learned from international and local experts who have immerse knowledge on international AM standards and the benefits that the standards can bring to their business for market access. Mr Matthew Waterhouse, Chairman of AM, Technical Committee made opening remarks. 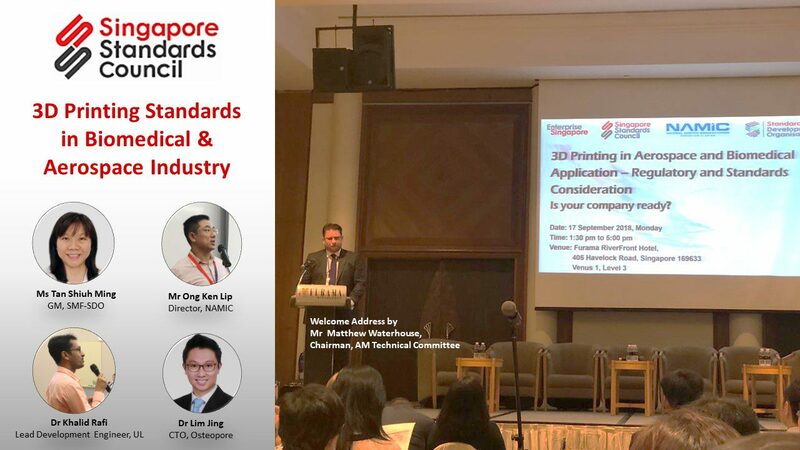 He later moderated a panel discussion comprising of Mr Ong Ken Lip from NAMIC, and representative from ISO and ASTM comprising of Dr –Ing, Christian Seidel, Mr Jeffrey Loy, Dr Khalid Rafi and Dr Lim Jing. Held on 17 September 2018 at Furama RiverFront Hotel, the workshop was jointly organised with SMF-SDO and NAMIC and supported by Enterprise Singapore.